OREGON PowerNow CS250 40-Volt : A perfect electric chainsaw for homeowners. An Oregon chainsaw is a beautiful thing. Unfortunately, Oregon only makes a few chainsaws but the ones they manufacture are excellent. 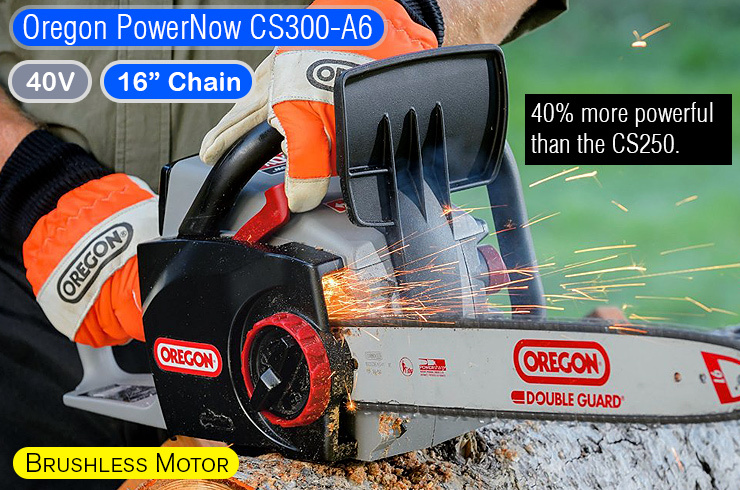 This article will focus on the PowerNow CS250, but if you’re looking for an inexpensive electric then the PowerNow CS1500 is a fantastic Oregon chainsaw to consider. NOTE: The latest and greatest iteration of the PowerNow technology is the CS300-A6, which is 40% more powerful than CS250. You can read all details about it later in the article, but for now, I just want to let you know that chainsaws evolve and grow over time. If you’re going to buy something for the long-term, make sure you consider all the factors before making a final buying decision. Pull the lever and sharpen your chain. It’s brilliant! It’s an excellent online resource and stand-alone magazine for anyone interested in living a conscious life and taking better care of the environment. If you’re a reader of Chainsaw Journal you’ll know that I’m already a big fan of the Oregon PowerNow CS250 cordless chainsaw as I included it prominently in my article entitled The Best Electric Chainsaws. 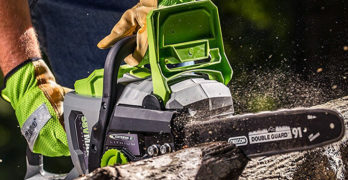 If you’re in the market for a top quality saw then this Oregon chainsaw should be at the top of your list; alongside the impressive GreenWorks 80V and the GreenWorks 20312 DigiPro G-MAX 40V (16-inch)— another powerful battery operated chainsaw; equal in terms of power, durability and efficiency. This blog might seem like a commercial endorsement, but let me explain. First off, here is a short video I made about the Oregon 40-Volt battery powered chainsaw which I’m really impressed with… actually I really love this chainsaw! As you read the article you quickly find out he’s someone with more than a passing interest in living off the grid and living as a homesteader (someone who lives off the land). Homesteading is becoming a growing segment of the population as people are deciding to pursue an alternative way of life. I think we live in a world that doesn’t nourish the human spirit in the way our biology requires. The the cold reality of living and working in large cities is taxing on our soul; and the hustle and bustle that goes along with city life can take its toll over time. Sorry for the diversion. 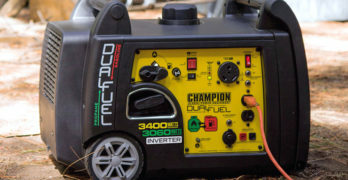 Unfortunately power tools come and go and in the case of battery powered technology there will always be a more powerful battery to come along surpass what’s currently on the market. Hopefully Oregon introduces their own more powerful battery chainsaw in the near future. Until then, the Oregon PowerNow CS250 is an excellent electric chainsaw with plenty of power for the needs of a typical homeowner. With a 40V lithium-ion battery it can tackle almost all your projects. It’s not as powerful as a gas chainsaw so it’s not suited for heavy-duty cutting but it’s perfect for light to medium-duty work, including tasks such as: felling small trees, pruning, limbing, cutting firewood and various other wood cutting tasks, such as cleaning up after a storm. If you don’t mind having to work around an extension cord then I suggest you consider a corded chainsaw and you’ll never have to worry about your battery dying on you while you work. A highly durable electric chainsaw with a powerful 40V battery. The most unique feature about the PowerNow CS250 Oregon chainsaw is the built-in chain sharpener that they have patented called the PowerSharp system. Within a few seconds it can turn a dull chain into a razor sharp chain so you’ll have no more excuses for cutting with a dull chainsaw. Most people underestimate the importance of cutting with a sharp chain as it increases the effectiveness and efficiency of your chainsaw; not to mention that it’s much safer to cut with a sharp chain, preventing the likelihood of having your chain getting caught and causing kickback. Oregon PowerNow B600E 40V Battery. So this Oregon battery-powered chainsaw is a pretty great intermediate step. It’s not good for a full day of cutting, but it’s great for some cutting and performs well once you get used to it. For someone just getting started with a chainsaw it’s perfect. And for someone with a slighter build it is far less intimidating than a gas powered one. OREGON has been manufacturing chainsaws since 1947 so you can be assured that they make quality products. They have a wide range of tools and accessories related to chainsaws and other power equipment. If you need the use of a chainsaw but require cutting from a distance you might be interested in their pole saw which uses the same 40V lithium-ion battery system: OREGON PS250 Pole Saw. It’s great to read other articles on quality products such as the OREGON CS250 being covered and reviewed on well respected sites like Mother Earth News. OREGON 40 Volt MAX* C750 Rapid Battery Charger. View or download the INFORMATION SHEET for the PowerNow CS250 Oregon chainsaw. Consistent power for the duration of the battery running time. Runs at full power until empty. No fade power. 14″ Oregon Chain & Bar. 3/8″ low profile chain pitch; .050″ chain gauge. No load chain speed of 2,350 feet per minute. Just a lever pull for 3-5 seconds & the chain works like new. Low Noise and Instant Start. Up to 4 times quieter than gas saws. Silent between cuts. lightweight and balanced. Low vibration. Weight: 11 lbs (5.0 kg) with 1.25 Ah Battery Pack. Weight: 12 lb (5.4 kg) with 2.4 Ah or 4.0 Ah Battery Pack. This is the newest model which replaces the CS250. An improved version of an already great chainsaw. 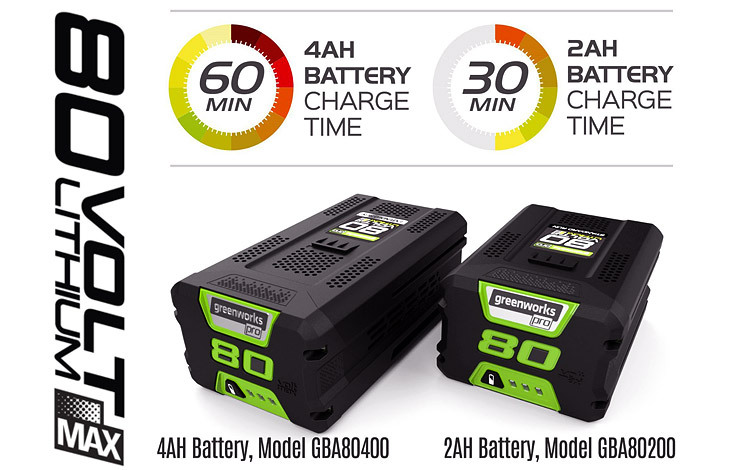 The biggest disappointment with this Oregon chainsaw is the fact that the standard battery charger is slow and takes up to 3.5 hours to fully charge — which is a long time when you compare it to the charge time of the 80V GreenWorks chainsaw (Read more in the next section), which takes 30 to 60 minutes, depending on the battery (2.0Ah or 4.0Ah). Yes, you can and should buy the C750 Rapid Charger which allows you charge the battery between 30 to 60 minutes, depending on the battery power. It seems silly that Oregon doesn’t include their rapid charger as standard equipment. Either way, this PowerNow is an excellent chainsaw with the standard Oregon self-sharpening system. This chainsaw continues to evolve and improve over time. View or download the PRODUCT SHEET for the Oregon PowerNow CS300-A6. View or download the MANUAL for the Oregon PowerNow CS300-A6. 40V MAX* Lithium Ion Performance Brushless motor. 40% more power than CS250. High power for fast cutting with a 16″ (40 cm) bar. Long run-time. Constant, no-fade power. Holds charge in storage for months at a time. PowerSharp System Sharpens chain in seconds. Low Noise: 4X times quieter than a gas saw. Silent between cuts. Comfortable to use. Ergonomic Design. PowerSharp Chain 3/8 inch; Low Profile. Gauge: .050 in. Cuts approximately 400 branches 2-3 Inch in diameter on a single battery charge. Charge Time: Approximately 210 minutes. Chainsaw technology is constantly changing. Sometimes it’s hard to keep up with all the different models but we do our best to continually update you on new models as they come out. Recently, GreenWorks introduced a line of 80V power tools, including an impressive 80V chainsaw. For the ultimate in battery power, this is it. The GreenWorks 80V chainsaw is the equivalent of a 45cc chainsaw. Not bad for battery power. Read our recent in-depth REVIEW of the impressive GreenWorks GCS80450 80V chainsaw. The power of a gas chainsaw with the convenience of a battery chainsaw. The styling and design of this chainsaw is a modern update to the tradition gas chainsaw that most people are familiar with. Most battery chainsaws resemble a toy but this 80V GreenWorks chainsaw feels solid in your hands. You immediately feel the heft and durability of this product. This is a professional battery-powered chainsaw that can tackle heavy-duty projects around the home. 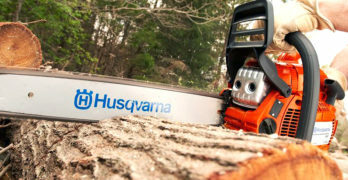 Battery life is the only drawback, but that’s true for all battery chainsaws. Beautiful design, coupled with great ergonomics and power. Extra batteries are expensive. Fortunately, you get a 2Ah battery and a charger with the purchase. But, if you want to work for extended periods of time then you might have to indulge yourself and buy an extra battery. It really depends on how you intend to use the chainsaw. Fast charging batteries to reduce downtime. The proof is in the cutting, and for that, I suggest you watch the video below. Read the review of the GreenWorks 80V chainsaw.